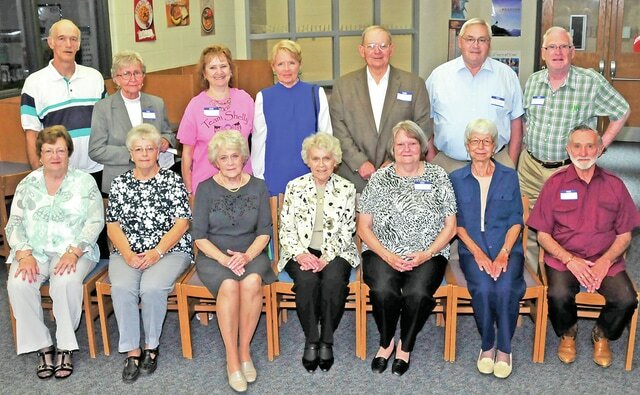 LeAnne Gompf | Morrow County Sentinel In this photo are members of the Cardington High School Class of 1960 who met at the Cardington-Lincoln High School Alumni party to celebrate the 60th anniversary of their graduation. Back row, l-r: Bob Sparks, Jo Bingman Pegelow, Penny Warfel Albright, Connie Crum Sparks, Bill Bartley, Dale Levering and Larry Ault. Front row, l-r: Pauline Betts Yake, Sharon Chalfant Boger, Sondra Denton Price; Ronda Denton Coleman Janet Orewiler Rush, Marge Westbrook Gattshall and Larry Wallace. Absent from photo are Maeve Murphy Shapiro and Gary Gandee. Members of the Cardington High School Class of 1960 met for lunch at the Cornerstone Cafe, Mount Gilead before touring the Flying Horse Farm in Mount Gilead on May 23. That evening they met at the Cardington-Lincoln High School joining the Cardington-Lincoln High School alumni party to continue the celebration of the 55th anniversary of their graduation. Present were Jo Bingman Pegelow, Mesa, Arizona; Larry Wallace, Ninilchik, Alaska; Maeve Murphy Shapiro, Santa Ana, California; Janet Orewiler Rush, Clayton, N.C.; Marge Westbrook Gattshall, Marion; Larry Ault, Shelby; Bill Bartley, Bucyrus, Connie Sparks Crum, Columbus; Pauline Betts Yake and Gary Gandee, Mount Gilead; Sondra Denton Price, Delaware; and Dale Levering, Ronda Denton Coleman, Robert Sparks, Penny Warfel Albright and Sharon Chalfant Boger, Cardington. The class plans to meet next in five years.